Donna: OK. From now on, I'm buying flats. I mean, these assaults are weekly. It's ridiculous. It's just so not conducive to high fashion. Curtis, who went home in order to rest, hears about the bee attack on Palmer Tech. Paul insists he stay home, but Curtis runs out the door to find help--from Team Arrow. Lance arrives at the bunker to inform Laurel and Oliver about the bees. (He's so worried about Donna. I'm dying.) Oliver tells his team to suit up even though the police claim the building is impenetrable. (Good ole Ollie, not giving up!) Curtis shows up at the bunker--somewhat by accident and somewhat following a phone with a tracker. The next few minutes are a constant stream of him fanboying over everything in the bunker; oh, and he passes out when he finds out Oliver is the Green Arrow. Felicity, Thea, and Donna escape from the office through an air vent, but the bees chase after them. They hide in a closet when one of the bees starts talking... in Curtis' voice! He managed to override its computer system to take control. He deactivates the bees, and Team Arrow swoops into the building. But it doesn't last; the bees evolve to block him out. This time, they form into a solid figure: Bee Man. (Seriously, though, it looks like a cheap cosplay of Yellow Jacket from Ant-Man. Oops, wrong fandom!) They fight the bee, but Oliver gets stung. When they bring him back to the bunker, they learn he didn't just get stung but the bee is inside of him. And it's replicating. Felicity comes up with a plan to rescue the board member. She uses the elevator to go down to the board meeting room; however, that floor isn't supposed to be accessed from the elevator, so Thea blasts the wall open. The board members and Donna escape down the elevator to a secret panic room. This leaves Thea and Felicity to face Bee Chick. They talk to her, and she explains that she has a tumor on her spinal cord. To cut it out and save her life, she'll be paralyzed. She wants the chip so she can still walk. Felicity, at gunpoint, tells her where the blueprints for the chip are. At the bunker, Curtis goes over the components of the robotic bees with the team. However, the bees have probably already adapted to their canary call technique, so it won't work again. (Typical.) Oliver gets angry at Curtis' excitement, so Laurel has to pull him aside to give him a talk about his frustration. Laurel tells it to him straight: his choices caused Felicity to break up with him. She encourages him by telling him that as the Green Arrow he gives people hope. (Okay, they're totally setting these two up.) Oliver apologizes to Curtis, who is now terrified of Oliver. He continues to work to get rid of the bees. He puts a virus into an arrow so Oliver can shoot it into the swarm and stop them once and for all. Felicity and Thea find a computer to hack into and try to get out of the building. Thea gives Felicity pretty much the same speech Laurel just gave Ollie--they do what they do to bring hope to the city. But Felicity is adamant that she is not coming back to the team. The Bee Chick returns because in her exploration of Palmer Tech she learned Felicity is the hacker who sent her to prison in the first place. So now she's out for revenge. Felicity: I mean, look around you. Thea, we're in a Die Hard movie with bees. Maybe I'm meant for great things, maybe I'm not, but whatever it is, it's not this. I'm sorry. I'm not coming back. Team Arrow arrives just in time to save the day. The Bee Man also returns. He knocks Thea out. Oliver fights him while Felicity runs around the room. Curtis hacks the virus as the bees adapt to it. The bee from Oliver escapes and chases him around the bunker until Lance manages to catch it. Felicity breaks a lamp and thrusts the electrical end into the Bee Man, which causes him to dissolve. Bee Chick shoots at Oliver, thinking that will exact revenge on Felicity. But then, Curtis takes over the bees and makes them swarm the Bee Chick, injecting her with their toxins. Felicity and Thea relax at Palmer Tech after the incident. Thea asks if she missed this kind of rush of adventure. But Felicity says she didn't help the Green Arrow for the rush--she did it to help people. And now she can use Palmer Tech to help people and be a beacon of hope for the city. Merlyn: He said you were his Ace-in-a-Hole. Is that what you'd like me to call you, or do you prefer Mr. Diggle? The Island story still stinks. So we already knew Reiter had magical voodoo powers (or whatever). 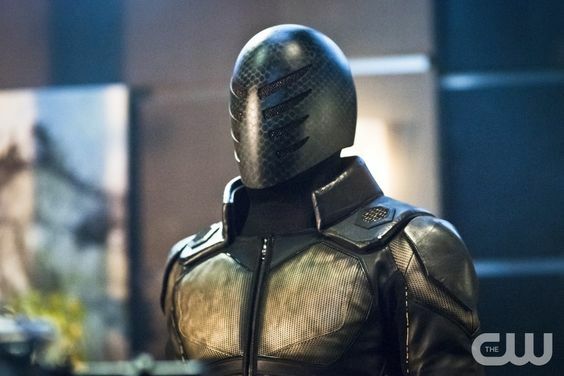 I imagine he can do what Darhk can, which will connect the flash backs to present day events. Curtis, however, was a pleasant surprise. He's been around here and there before, but this is the first episode that was... his. I love his personality, his jokes, and his pop culture references. I'm sad he won't be joining Team Arrow (for now), but I hope he's still around for more fun! He is pretty...terrific! What did you think of "Beacon of Hope"?